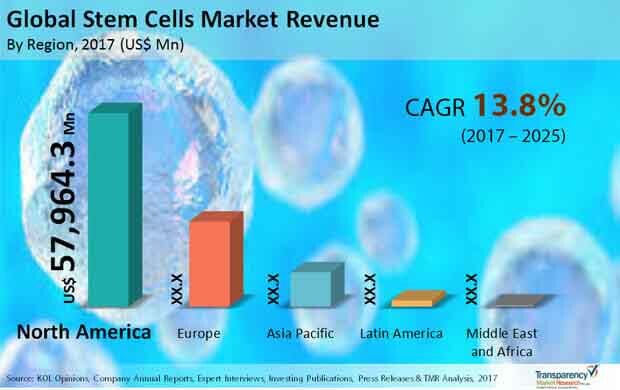 The global stem cells market is envisaged to gain a whole lot of demand owing to the perpetual focus on research conducted to expand the utilization of associated products for several applications. As a result, stem cells have been used in the treatment of various diseases and witnessed the discovery of several clinical applications previously unfolded. Players could look to broaden their cellular therapy portfolios to include a wide scope of diseases such as Alzheimer’s, type 1 diabetes, Parkinson’s, and spinal cord injury. This could be due to the worldwide acknowledgement of cellular therapies being the next major step in healthcare improvement. The global stem cells market could be segmented according to end user, application, source, and product. By product, adult stem cells are forecast to take a leading position in the market. The report presented herewith is a brilliant compilation of growth factors, segmentation study, geographical analysis, vendor landscape study, and other aspects that could prove to be significant for ensuring a strong growth in the global stem cells market. The world stem cells market is predicted to attain favorable growth prospects on the back of the positive impact caused by swelling investments from biopharmaceutical and pharmaceutical companies for conducting stem cell research. Increasing incidence of chronic diseases could be another powerful factor augmenting the demand in the market. For the coming years, market growth is anticipated to be cemented with the rise of increasing research and development, high-quality stem cell banking facilities, and rising count of stem cell donors. Amongst all major types, adult stem cells are projected to secure a high demand in the near future as they could multiply into scores of specialized cells capable of repairing tissue damage and lowering the risks of rejection. Budding segments such as induced pluripotent stem cells could also offer rewarding prospects in the market with the help of their unique traits and advantages. The international stem cells market is foreseen to testify the dominance of North America which has always been at the forefront of the adoption of latest technologies. Besides its impressive technological progress, the region could improve its growth while riding on the increasing prevalence of target chronic disorders, high economic growth, and massive investments in the industry. As a result, the regional market is forecast to showcase a colossal growth in the coming years. Treading on the heels of North America, Europe could also provide lucrative growth opportunities in the international stem cells market due to factors such as medical tourism. An increasing number of U.S. and Canada patients have been witnessed to travel to Europe for taking treatments made available at economical costs. Asia Pacific is envisioned to exhibit a relatively slower growth in the market due to various reasons. With a view to expand their presence as well as their portfolios when operating in the worldwide stem cells market, players are foretold to work out strategic partnerships and collaborations with pharmaceutical firms. Moreover, they could look to raise funds with the help of overseas organizations to introduce new stem cell-based therapies in the market. Some of the leading companies in the market could be Cellular Engineering Technologies Inc., Astellas Pharma Inc., and STEMCELL Technologies Inc.